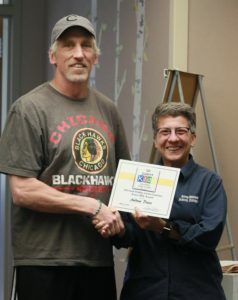 South Whidbey High School math teacher Andy Davis received the 2018 Teacher Extra Mile Award, voted on by his faculty peers. In addition to the plaque, Davis received a $500 check. 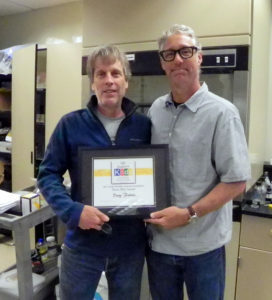 South Whidbey High School teacher Doug Fulton received the peer-nominated 2017 “Extra Mile Award.” He teaches science at the high school, and was nominated by colleague Charlie Davies, lead educator for the South Whidbey Academy, and himself a previous award recipient. “I have worked closely with Doug over the past nine years. In my previous role as Special Education Case Manager, Doug was always more than willing to have struggling students in his Biology class. He would never complain about the extra burden that was placed on him or the hours of time I would take from him to talk about the kids and how to best support them. “Doug would always find a way. He would always say to me, ‘Don’t worry, if the student comes to class, we’ll find a way,’ and he did. Countless Special Education students over the past years have fully participated in Doug’s Biology class with minimal to extensive modifications to the class. These students passed the class, earned their science credit and passed their state assessment. 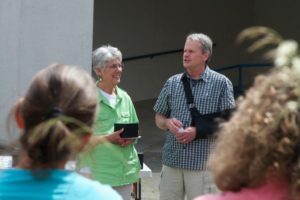 “This year Doug took on a new challenge working to create a Biology class for the South Whidbey Academy students. He did just what he has always done. He made it work. The students were challenged and engaged and the class was a great success with students earning credit and passing the state assessment. 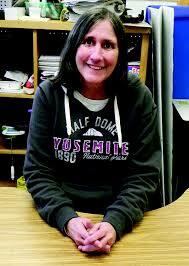 “I have also watched Doug over the years coach Cross Country and Track. He puts in tremendous amount of time and energy. He goes far above and beyond what is expected or even the norm. Doug has created a Cross Country experience that feels more like an extended family than a sports team … “Doug quietly goes the Extra Mile every day. We are lucky to have him,” Davies wrote. 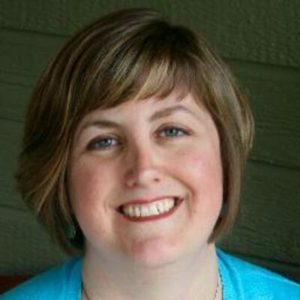 Speech language pathologist Becky Breeze, a member of the special education departments at both the elementary and middle schools received the South Whidbey Schools Foundation Extra Mile Award for 2015/16. The Extra Mile Award acknowledges and honors current teachers for “having gone the furthest in the service of the South Whidbey education community,” according to a press release. 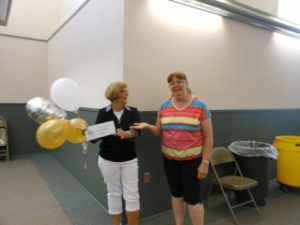 Breeze received the award from School Board Director Linda Racicot at a faculty luncheon June 17. “Becky is committed to providing quality services to each student she serves, teams well with all staff, values every student and recognizes their achievements, [and] is a lifelong learner and shares what she learns,” said Robin Roberts, a colleague of Breeze. The Extra Mile Award acknowledges and honors a current South Whidbey School District teacher for having gone the proverbial “extra-mile” in terms of service to students and faculty. This year’s recipient is Charlie Davies, a South Whidbey graduate and the special education and work-based learning teacher at South Whidbey High School. Davies’ nomination was endorsed by more than 25 district faculty and staff. 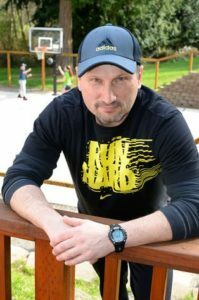 “I have seen Charlie be a teacher first, but also a mentor, adviser, coach, trainer, disciplinarian, and someone who the students look up to and strive to be like. He can take a bad situation and turn it into a great positive learning lesson for the students. He amazes us every day. I can go on and on about the respect I have for this man. He gives everyone around him the feeling of wanting to do their best,” wrote one colleague. “He goes above and beyond to make sure he has given our students every opportunity to succeed,” wrote another. 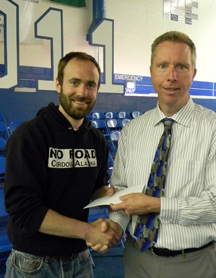 The award, which includes a cash stipend, was presented to Davies at the Senior Farewell Assembly for the Class of 2015. 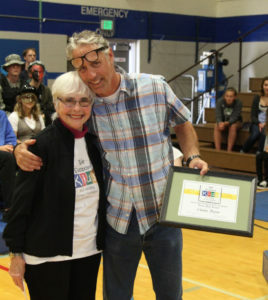 The Extra Mile Award, which acknowledges and honors a current South Whidbey School District teacher for having gone the farthest in the service of the South Whidbey education community, went this year to Louise Fiori, retiring math teacher at South Whidbey Academy. Fiori was nominated by the entire staff at the Academy. 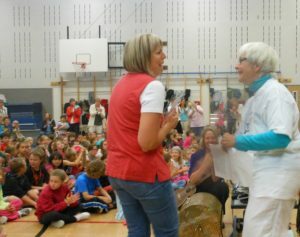 For the first time in its 18-year history, the South Whidbey Schools Foundation awarded three teachers its “Extra Mile” award at the June 18 end-of-school-year Elementary and Middle School Assemblies for the 2012/13 school year. The award, along with a $250 check, was presented to Becky Ward and Michelle Zisette, both South Whidbey Elementary Special Services teachers, and to Nels Bergquist, a Langley Middle School English and Social Studies teacher and a second-time recipient of the award. 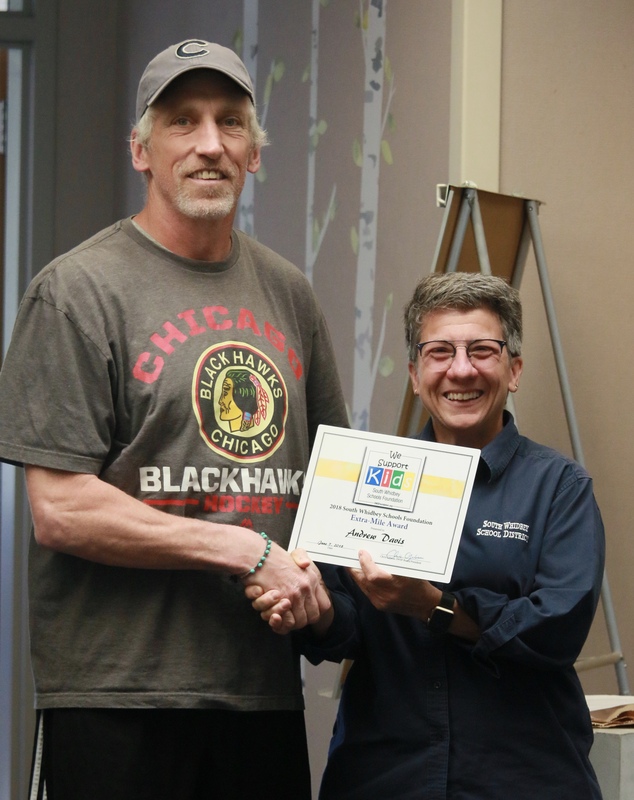 The “Extra Mile” award goes to a South Whidbey educator nominated by his or her peers and selected by the Foundation Board for extraordinary service provided to South Whidbey students and schools. Val Brown, the 2010/11 Extra Mile Award recipient, has taught kindergarten and served as a library media specialist for the past 18 years in the South Whidbey School District. Fellow staff members describe Brown’s work in the library as exceptional because she “…makes the Elementary Library a welcoming place for all students, going far beyond her contractual hours to make sure the library is opened during rainy day and lunch time recesses.” Brown has enjoyed working with a very supportive staff. She reports that any time she says, “I have this idea…, people are always willing to jump in and help me make it work. They make me look good.” Some of the highlights mentioned by others include I-Did-A-Read, during which each class worked collaboratively to create a dog that moved along an Iditarod map showing how many hours that class read. Another hallway adventure was encouraging students to read all of the Washington state picture books competition. “It was wonderful to be in the hallway when students arrived in the morning and see them get excited about books and have meaningful conversations about them.” Brown also seeks ways to include world events in the students’ reading. 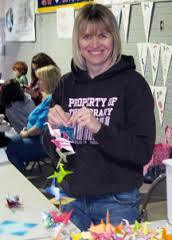 For example, after the devastating Japanese earthquake, Brown shared the book, Sadako and the Thousand Cranes with students, and spearheaded the entire school to make 1000 cranes, now hanging in the library. With the awareness of childhood hunger, she used a book called What The World Eats as a springboard to awareness of families suffering from hunger in other countries. Involving families is also important to Brown who enjoys Dolphin Family Book Club and Harry Potter night. Clearly, she celebrates literacy by supporting and encouraging the broad SWES community of children, parents, and staff. We should mention that due to budget cuts, Brown will become the Title Reading teacher at SWES where she will continue to promote literacy with students, staff, and parents. The Extra Mile Award was originally funded by an anonymous donation and is sustained by donations to the Foundation. A $500 cash gift accompanies the award. Jennifer Gandarias, teacher at the South Whidbey Elementary School since 1998, was awarded the 2009/10 Extra Mile Award for Excellence in Teaching to honor teachers who have gone the farthest in the service of the South Whidbey Education Community. Gandarias is well loved by students, staff, and parents who appreciate her outstanding outreach to parents so that all students are achieving to the best of their abilities. She is also recognized for her generosity in assisting other staff with integrating technology into their teaching and learning. Staff nominations include comments that Gandarias has more energy than any five people put together. She is passionate about technology and spends countless hours incorporating it into her lessons, teaching other staff, and attending workshops, at her own expense. Additionally, she pairs with Mary Ridley to run an after school garden club. Gandarias cares about each student and adapts her lessons to reach each child….She is an all around outstanding teacher. 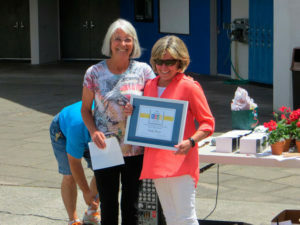 The 2006 Extra Mile Award was presented to Dianne Moondancer, English and psychology teacher and Director of the Bayview School, who also had numerous nominations for the award. 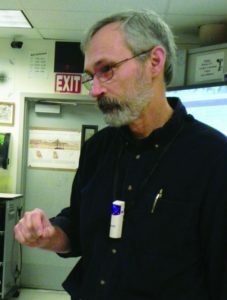 Rich Conover, visual arts teacher at South Whidbey High School, was the 2004 winner of the South Whidbey Schools Foundation’s Extra Mile Award winner. Rich, in his 27th year as a public educator, is estimated to have taught more than 2500 students. He has maintained an intensive, hands-on art program which he built from the ground up, and which is rivaled only at college and professional levels. 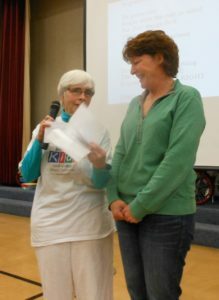 Amidst the cheers of South Whidbey Intermediate School students at their year-end awards assembly, teacher Kathy Callahan was announced as the winner of the 2003 Extra Mile Award.